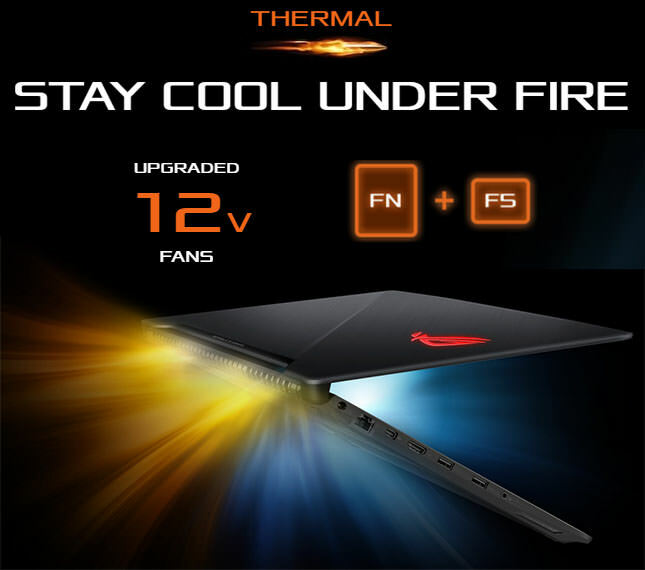 ROG Strix SCAR Edition is built exclusively for the sharpest shooters in the meanest gunfights optimized to gain a competitive edge in FPS titles such as Counter-Strike®, Overwatch® and Team Fortress® 2. 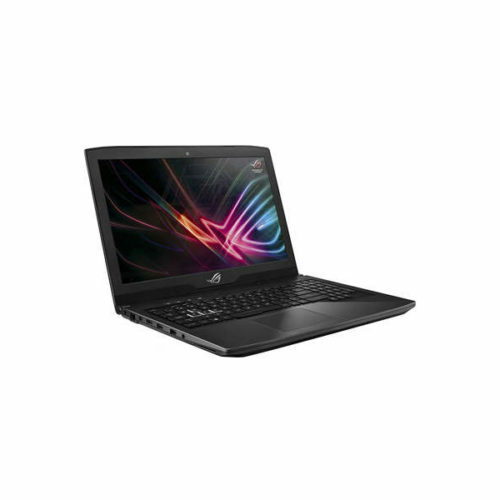 You’ll enjoy the power of the latest Intel® Core i7 processors, NVIDIA® GeForce® GTX 10-Series graphics and Windows 10 Pro with a superfast 144Hz IPS-level display. 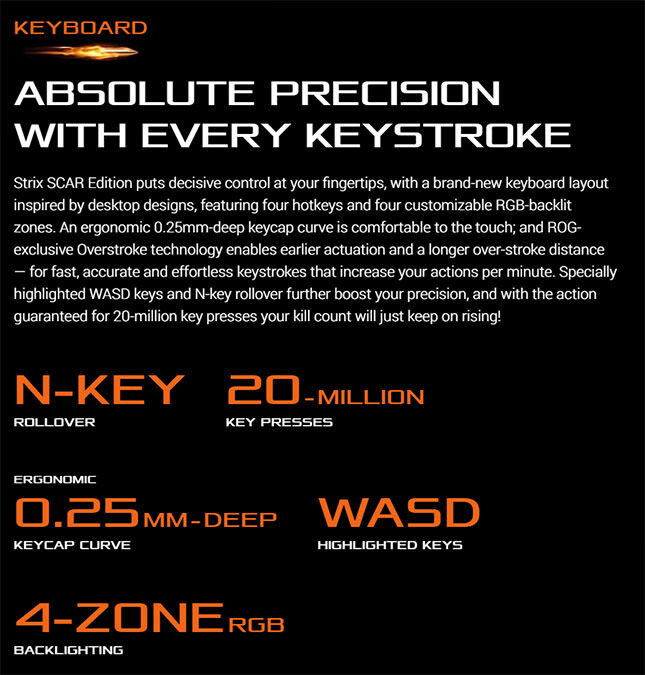 With a desktop-style keyboard layout, N-key rollover and fast-actuating keys, Strix SCAR Edition keeps you centered on the maps so you’ll rank high, and kill with absolute precision! Your every twitch, target and takedown are deeply infused into Strix SCAR Edition, a war machine meticulously designed to support and enhance your shooting skills for even more kills. Taking both its name and design inspiration from the combat assault rifle packed by special forces and used in warfare, Strix SCAR Edition is crafted in gunmetal gray and finished with the cold, dark feel of bullet-proof Kevlar an outward projection of your inner calm, focus and precision. Bulk would compromise your enviable agility and performance, so all this lethal firepower is packed into compact body thats as thin as 2.3cm and as light as 2.5kg! Upgrade your arsenal with the latest 7th Generation Intel Core i7-7700HQ quad-core processor and NVIDIA GeForce GTX 10-Series graphics providing you with up to a GTX 1070, GTX 1060, or a GTX 1050 that’s been overclocked by 100MHz. 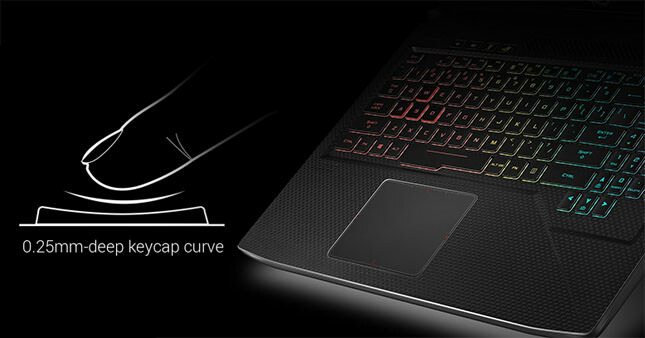 Whichever you choose, Strix SCAR Edition is armed with combat-ready computing power to rule the game. Cutting-edge storage, such as a 512GB M.2 NVMe PCIe® 3.0 x4 SSD and a 1TB Seagate® FireCuda SSHD, plus 32GB of high-performance DDR4 2400MHz memory guarantee superior performance. The difference between defeat and victory is measured in fractions of a second. Strix SCAR Edition upgrades your vision, with an IPS-level display with a 144Hz refresh rate to deliver smooth, accurate visuals, as well as eliminate lag and motion blur. The 300cd/m² panel ensures 20%-brighter visuals than low-end IPS panels from competitors. 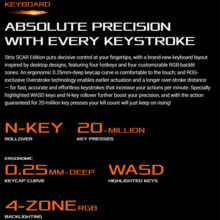 Strix SCAR Edition can also be specified with a 120Hz display with 5ms response time. Give your aim an upgrade, and sharpen your sights for the crucial moment of the shot! * Captured with a high-speed camera at 240 frames per second. Footage is played in slow motion at 30 frames per second. 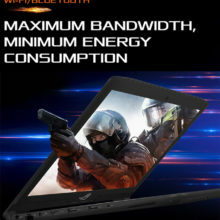 Panels with a fast response time provide sharper and clearer gaming visuals. 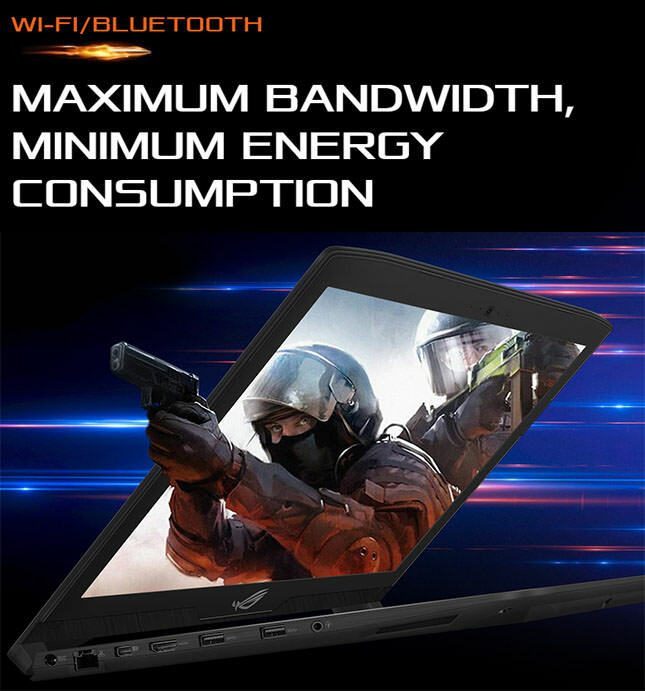 technology synchronizes the displays refresh rate with the GPUs frame rate to make gameplay silky smooth. G-SYNC minimizes perceived stuttering, reduces input lag, and eliminates visual tearing all without affecting system performance. You get the smoothest and fastest experience even in the fiercest gunfights. NVIDIA GeForce GTX 1060 and 1070 Series VR-ready graphics put you in the midst of the action. Shooting games are hugely popular in the VR world so level up your marksmanship in a smooth, low-latency, and stutter-free setting. * GeForce® GTX 1060 or better is required for smooth VR experiences. Strix SCAR Edition delivers clearer, louder, and more accurate audio so every action sounds real, all powerfully delivered through two expansive side-firing speakers. With this immersive stereo audio, even the quietest sounds can be heard, so youll pick up on every hidden movement. Smart-amplifier technology monitors the audio output and makes real-time adjustments, so you can pump up the volume without worrying about damaging the cones  and that makes output up to 200% louder than before, with increased dynamic range and bass. ROGs Sonic Studio even offers in-game noise cancellation and voice-volume stabilization, boosting everything you can hear to enhance your performance. Every little advantage aids your march to victory  and Strix SCAR Edition ensures you hear every precise audio cue! 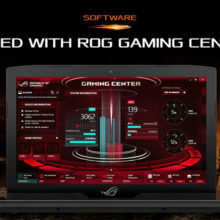 Summon ROG Gaming Center with a single press of a hotkey to see a comprehensive dashboard with loads of useful information, including both CPU and GPU frequencies, voltages and temperatures and use the control panel to make adjustments in real time. 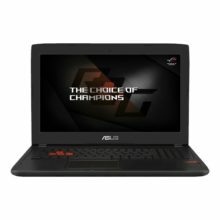 ROG GameFirst, Aura Core, as well as XSplit, can also be accessed through the Gaming Center. 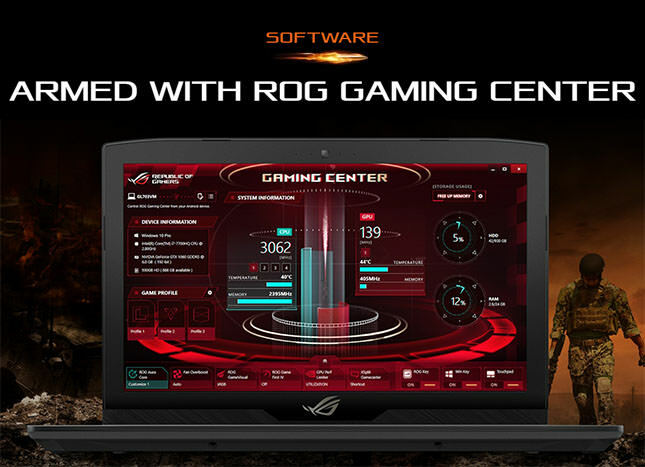 Gaming Center is even available via the ROG Android app, so you can keep all the controls close to hand. * Software may vary by product model. 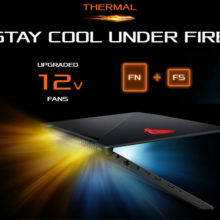 Strix SCAR Edition has an intelligent thermal design that employs heat pipes and dual fans to automatically adjust cooling system for optimized CPU and GPU performance. 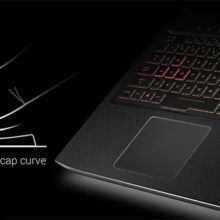 The specially-crafted venting holes above the keyboard and in the bottom of the laptop allow more intake of cool air. The upgraded 12V fans, which spin at higher speeds compared to traditional 5V blades, drive strong airflow to boost cooling efficiency, so you’re free to run the CPU and GPU at full speed without thermal throttling. An additional fan-boost function further increases cooling performance and guarantees total stability during even the most intense battles so you’ll keep a cool head even under fire! 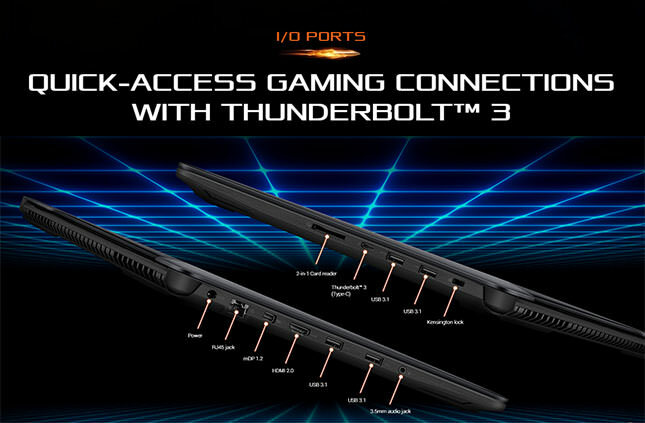 Strix SCAR Edition comes with Intel® Thunderbolt 3, up to four USB 3.1 Gen 1 Type-A, HDMI 2.0 and Mini DisplayPort 1.2 ports, so connecting the latest, greatest gaming peripherals is a cinch. 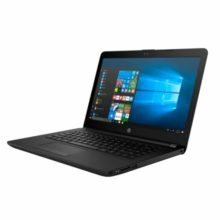 Onboard Intel® Thunderbolt 3 technology enables a total of up to 40Gbps bandwidth for data and display-signal streams, combined; while the USB Type-C (USB-C) connector makes it the most advanced and versatile port available providing single-cable docking and connections to displays. With Thunderbolt 3, Strix SCAR Edition opens up a world of possibilities, all via a single port. Strix SCAR Edition features the latest 802.11ac 2×2 Wi-Fi standard, with two antennas each for both transmission and reception, for speeds that are up to 6x faster than 802.11b/g/n  up to 867Mbps! 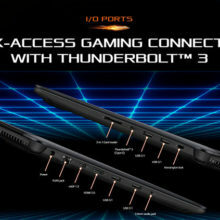 A more reliable and robust wireless connection ensures better gaming experiences. Strix SCAR Edition even has low-energy Bluetooth® 4.1, enabling you to game longer and more reliably with your Bluetooth peripherals!